Vitamin C- plays an important role in the production of collagen, the main constituent of cartilage in joints, which is necessary to keep joints healthy and flexible. Glucosamine- plays an important role in rebuilding the cartilage necessary for joint health and flexibility. Glucosamine stimulates the production of glycosaminoglycans that are structural components of cartilage. Chondroitin– helps maintain joint flexibility by hydrating the cartilage tissue. It also protects against free radical damage and blocks enzymes that inhibit the rebuilding of cartilage. Ingredients include Fructose, Citric Acid, Natural Flavors, Tapioca Maltodextrin, Malic Acid, Silica, Beta-Carotene, Annato Color, Glycine, Aspartic Acid, Tartaric Acid, Cysteine Hydrochloide. The product source does not provide the amount of these ingredients in a product packet packet (1 serving) but does include a table on their website that contains nutrition information for a single serving. 1 product packet 3 times a day in a 4 – 6 once glass of water. $10.75 for a 30 packet container. The product can be ordered from the vendor’s website. The vendor source does not include any information about product warranties or a product return policy. The vendor’s website does include a customer service number that prospective buyers can use to find more information. There are only 2 product review on the product vendor’s website but these reviews are favorable. The product is also competitively priced. Despite this a prospective buyer would be wise to contact the vendor’s customer service (the number can be found on the vendor’s website) to find out more about product warranties, return policies and shipping and handling costs before placing and order. 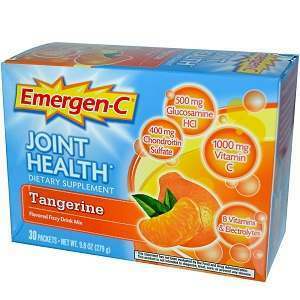 Mark Stevens	reviewed Emergen-C Joint Health	on January 2nd	 and gave it a rating of 2.